Have we got a Flash for you! 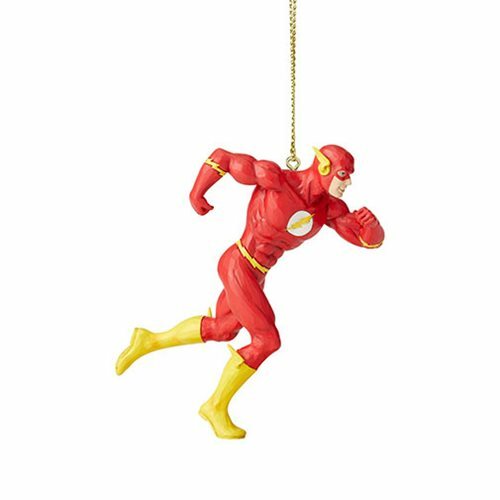 Hurry to order your DC Comics Flash Silver Age Ornament by Jim Shore before it dashes away! It measures about 3 1/4-inches tall and is fashioned of polyresin and calcium carbonate. Jim Shore is a treasured artist and something of a legend, inspiring his friends and expansive base of followers with work reminiscent of family, tradition, spirituality, and love of country. Shore's signature look of handmade, hand-carved art evokes appreciation and nostalgia, while embracing inspired themes of folklore and tradition found within American and European folk art. As a quilting aficionado, he often combines traditional quilt patterns with one of his favorite types of folk art, rosemaling, into his designs. Jim Shore's creations make much-appreciated gifts for almost anyone!